If you've ever played through any of the Fallout games and wondered to yourself, "Mmm, I wonder what that Mirelurk tastes like," then I have good news—a Fallout cook book is coming this fall. Fallout: The Vault Dweller's Official Cookbook by Victoria Rosenthal is a 192-page hardcover book filled to the gills with recipes themed from the game. Sadly you won't actually be eating Mirelurks or Deathclaws, because the radiation is just not safe to digest, and those critters are a bunch of fictional 3D models. But the recipes all take inspiration from stuff found in the wasteland series. While the majority of the recipes seem to be conventional dishes re-themed for the apocalypse, a lot of these delicacies sound interesting. Recipes include such classics as Deathclaw Omelets, Mole Rat Wonder Meat, Brahmin Fries, Baked Bloatfly, Radscorpion en Croute, and Mutant Marsala. And who can forget about dessert! Fancy Lads Snack Cakes top the list, but there's also Radioactive Gumdrops, Dandy Boy Apples, Slocum's Buzzbites, and Buffout. Side dishes include Brahmin Baked Potatoes, Sugar Bombed Carrots, and of course that BlamCo Mac and Cheese. You'll need to wash it all down, though. There's recipes for Nuka-Cola, Nuka-Cherry, Deezer's lemonade, Stimpak, Rad-Away, and something called a SPECIAL Cocktail. 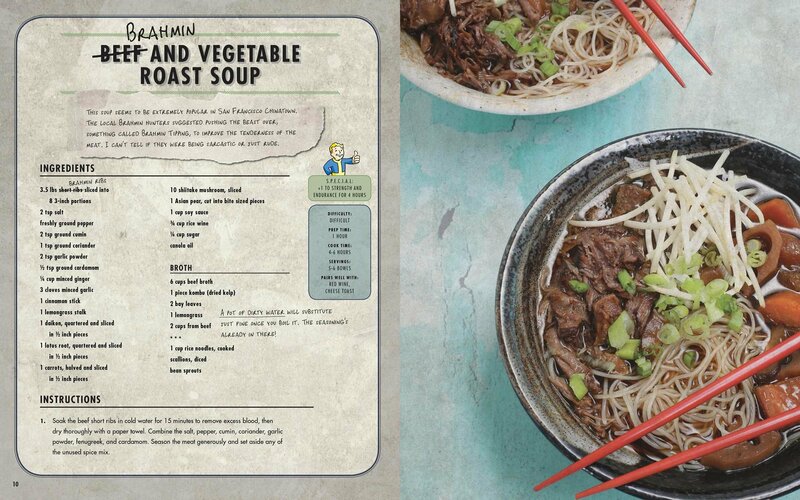 The cook book releases later this year on Oct. 23, so you'll have plenty of time to brush up on your wasteland foraging for when your friends come over to play Fallout 76 soon after on Nov. 14. Both the game and the book are available for pre-order.